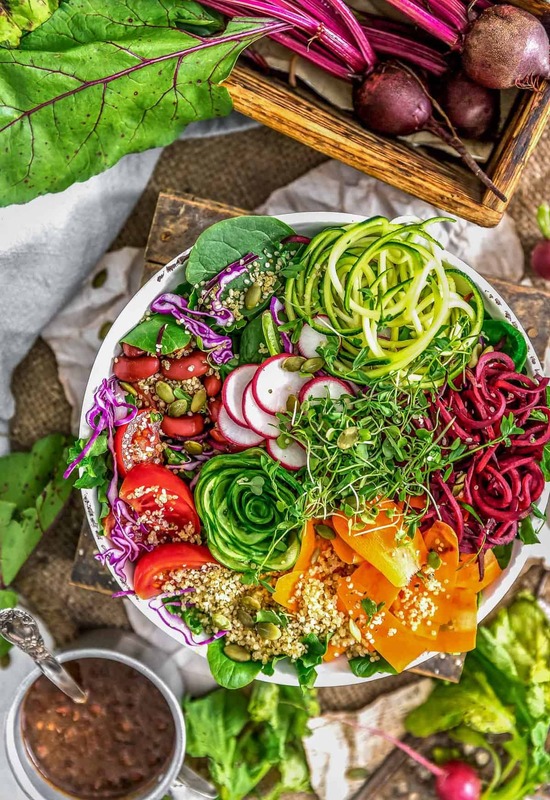 We don’t know about you, but we seriously crave salad ev-ery-day and the KEY is a healthy, delicious, and satisfying dressing. 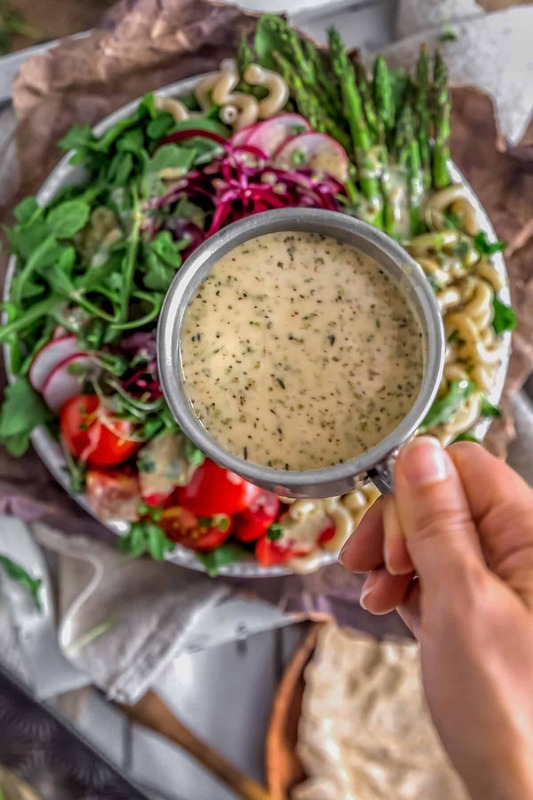 This creamy, tangy, rich, and cheesy Oil Free Vegan Italian Parmesan Dressing will have you dreaming of salads. 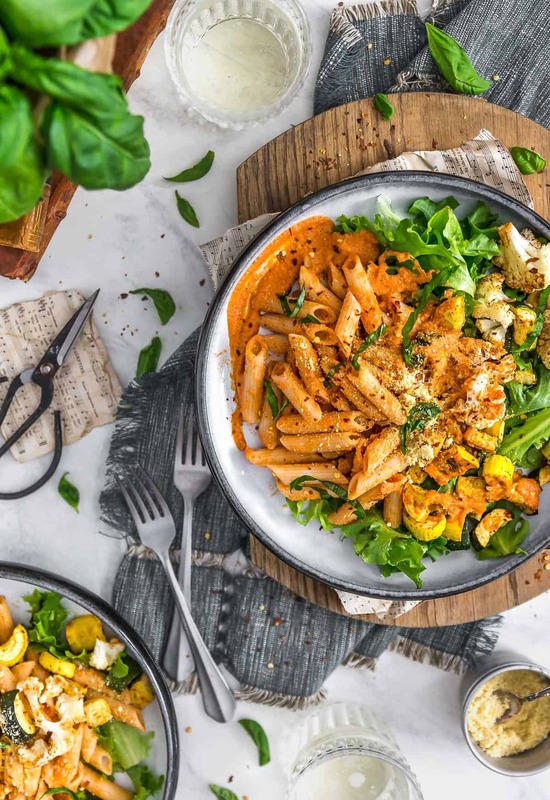 It’s a perfect blend of tangy red and white wine vinegars, velvety tahini, tart lemon juice, aromatic Italian seasonings, carmely maple syrup, nutty nutritional yeast all combined together to delight your taste buds. Making salad dreams come true with this week’s awesome Whip It Up Wednesday recipe. Whole Food Plant Based, vegan, plant based, oil free, refined sugar free, no highly processed ingredients and gluten free. This week’s Whip It Up Wednesday is our Oil Free Vegan Italian Parmesan Dressing. Every Whole Food Plant Based Facebook Group that I belong to has post after post from members wanting a tried and true great tasting salad dressing recipe. 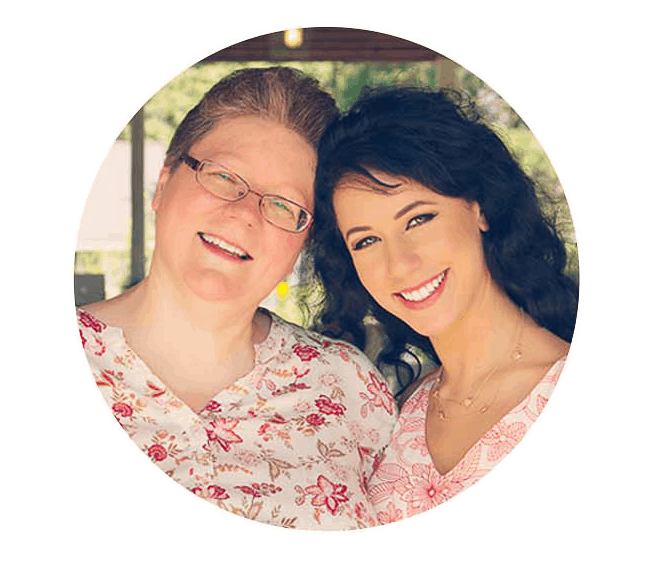 Look no further, Mom and I have another fabulous dressing that is fast, easy, and utterly delicious, and we can’t wait to share it with you! As you already know, every Wednesday, we feature a quick and easy recipe that can be “whipped up” in 20 minutes or less. This recipe can be made in about 3 minutes which really helps speed things up in the kitchen. 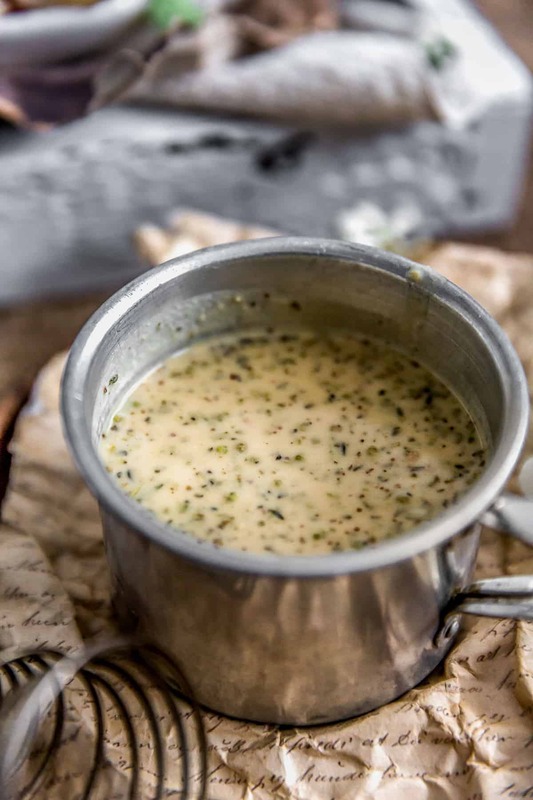 Once you taste this beautiful Oil Free Vegan Italian Parmesan Dressing, you are not going to believe how amazing it is. The nutritional yeast adds this lovely “Parmesany” taste to this already fabulous Italian dressing. We love this dressing on quick and easy veggie bowls. It really makes veggies pop and creates a fast and healthy lunch or dinner. 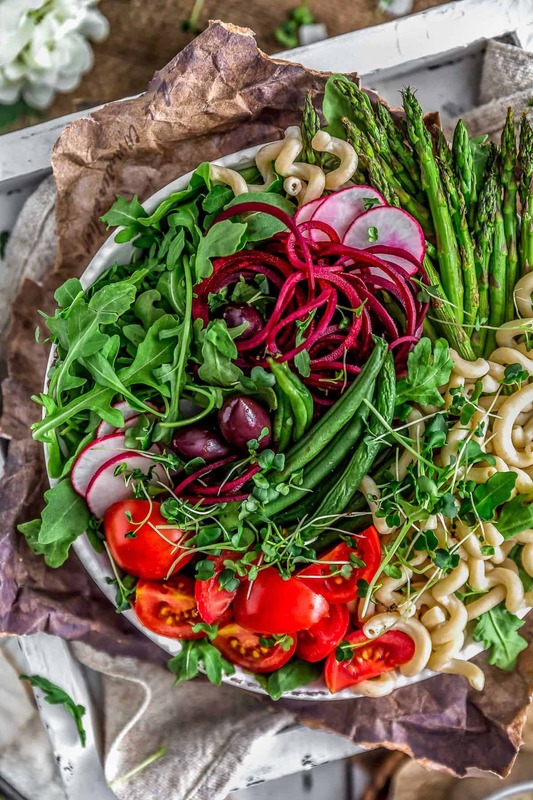 Mix and match your favorite veggies, add some cold pasta, protein and you have perfection in a bowl. 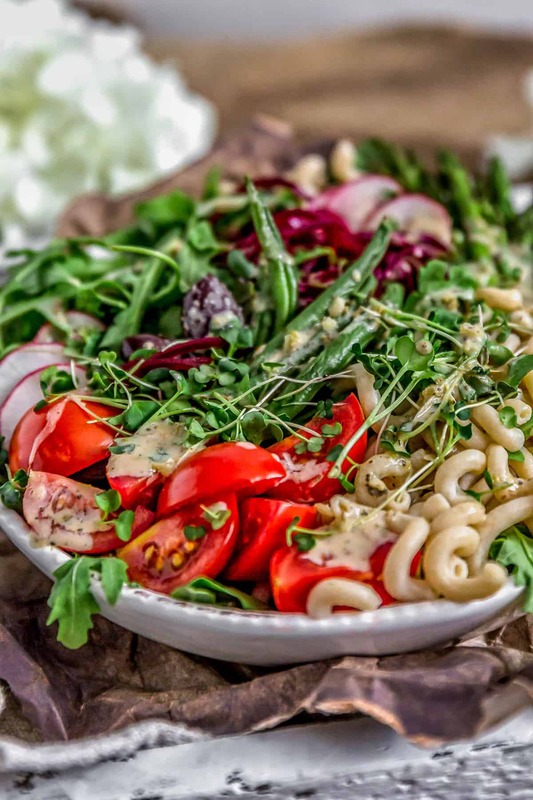 Ohhhh my goodness, cold pasta is all that and then some when added to your favorite salad bowl. We try to always have some on hand in the fridge. Simply cook some pasta according to package directions, drain off the hot water in a strainer, then run the pasta under cold water until completely cold. Shake off all the excess water, then store in the fridge for all those fabulous future salads you plan to make. If the pasta get stuck together (as it does sometimes), plop some in a strainer (all stuck together) and run cold water over it until they separate. 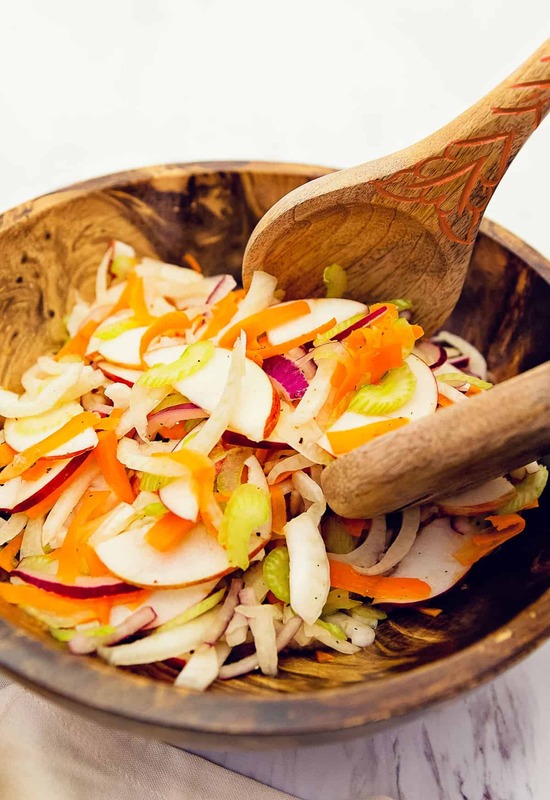 Shake off the excess water and then put that deliciousness in your salad bowl. I just know you are gonna LOVE it!!! 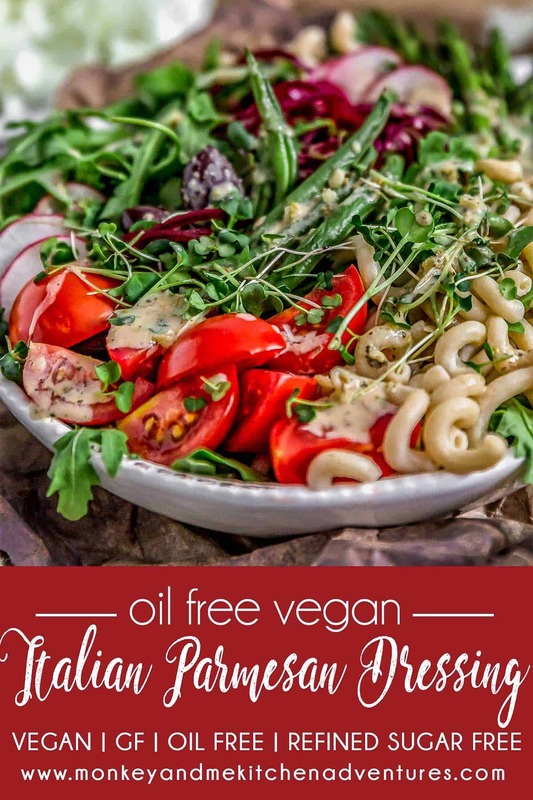 This Oil Free Vegan Italian Parmesan Dressing is everything you could ever want in a fabulous WFPB Vegan dressing. Give it a try on your next salad. It is crazy awesome! 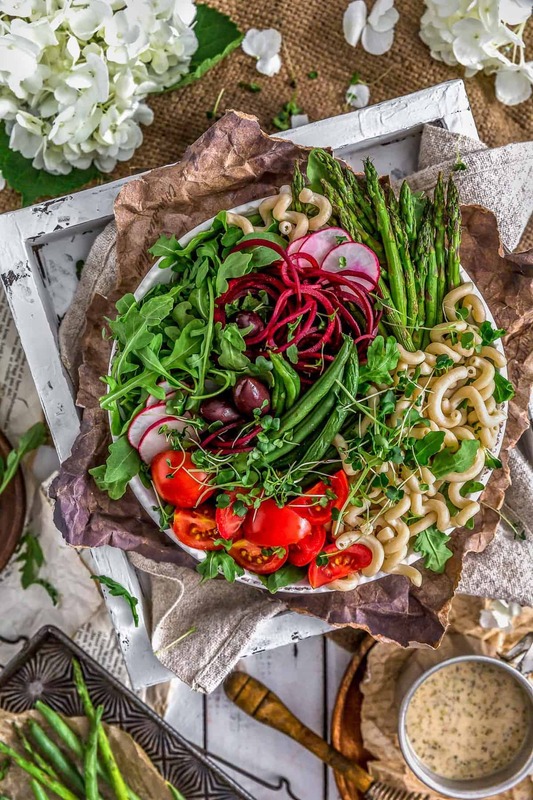 We don't know about you, but we seriously crave salad ev-ery-day and the KEY is a healthy, delicious, and satisfying dressing. 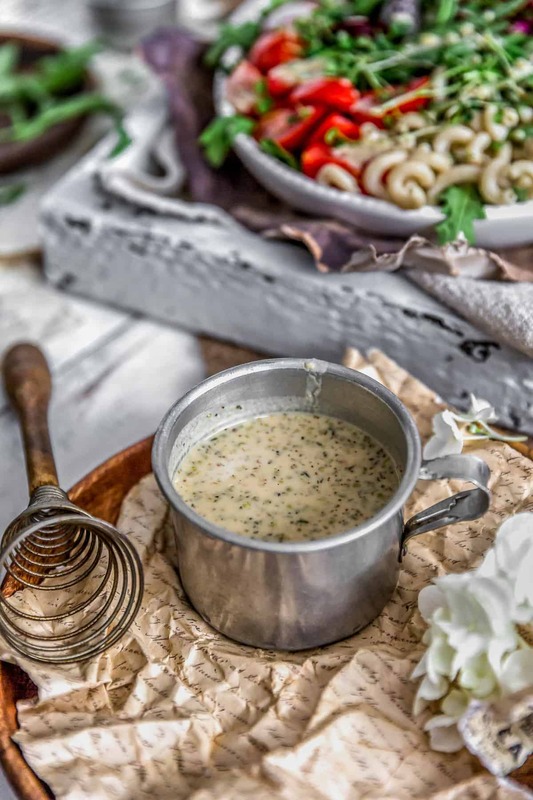 This creamy, tangy, rich, and cheesy Oil Free Vegan Italian Parmesan Dressing will have you dreaming of salads. It's a perfect blend of tangy red and white wine vinegars, velvety tahini, tart lemon juice, aromatic Italian seasonings, carmely maple syrup, nutty nutritional yeast all combined together to delight your taste buds. Making salad dreams come true with this week’s awesome Whip It Up Wednesday recipe. Whole Food Plant Based, vegan, plant based, oil free, refined sugar free, no highly processed ingredients and gluten free. Place the all the ingredients into a bowl, whisk well to combine (or process in a high-speed blender). Taste test the dressing, adjust the flavors as needed. I whipped up this dressing in the Nutribullet (I like a smooth dressing) and put it on a bean/rice burrito. Super tasty! Can’t wait to try more of your recipes! Yaaayyyy! We are so thrilled that you enjoyed our dressing! We truly appreciate taking the time to write as your support and encouragement means so much! Thank you for your very kind words! We are so excited that you have our Pumpkin Pie and Butternut Squash bookmarked, definitely favorites in our home. Wishing you a wonderful week!